The forthcoming wedding of Price Harry and Meghan Markle on 19th May will attract thousands of people to Windsor to witness the spectacle of the royal nuptials. Well-wishers will line the streets to see the procession winding its way through the town, following the ceremony at St George’s Chapel. It will be the third British royal wedding of the 21st century, the first being when Prince Charles married Camilla Parker Bowles at Windsor Guildhall on 9th April 2005. The second was the marriage of Prince William and Kate Middleton at Westminster Abbey on 29th April 2011. After they first met in London in the summer of 2016 through mutual friends, Prince Harry and Meghan’s relationship has evolved under intense media scrutiny, despite their efforts to keep it under wraps. Their romance blossomed away from the spotlight, but after making their first public appearance together at the Invictus Games in Toronto, Canada, in September 2016, a media frenzy ensued. Prince Harry, aged 33, who is a war veteran and a future heir to the throne, proposed to Meghan, 36, an actress and humanitarian, on 27th November 2017. Once the news of their engagement was made public, the excitement began in the build-up to the royal wedding. The wedding on 19th May will see the happy couple take part in a carriage procession through Windsor to share their happy event with the public. A royal wedding always brings out the best in British patriotism and this one will be one of the biggest Windsor has ever hosted, with thousands of flag-waving fans expected to line the route. People from all over the world will be converging on the town to watch the royal procession. The wedding has created a massive boom in business for local hotels, with some reportedly booking rooms at a minimum of £8,000 for a three-night stay for a room overlooking Windsor Castle. Television crews are said to have paid up to £10,000 to book suites of hotel rooms with balconies overlooking High Street to get a bird’s eye view of the procession! Although the wedding is being televised across the world, people will queue for days in various locations to catch a glimpse of the bride and groom, while some will just soak up the atmosphere. Street parties will be taking place across the UK and it has been announced the pub licensing laws are being relaxed for the weekend to enable people to celebrate the royal wedding – they will stay open until 1am on the eve of the royal wedding and after the ceremony. Previously, the rules have been relaxed for the wedding of Prince William and Kate, and for the Queen’s 90th birthday celebrations in 2016. There will also be wedding-themed tea parties and plenty of package holidays and city tours of London based around the event. Royal wedding celebrations will also be taking place in the United States, where plenty of hotels are providing their own royal-themed stays. In the run-up to the wedding, there are movie nights showing films with a royal theme and on the wedding day, the event will be screened live. 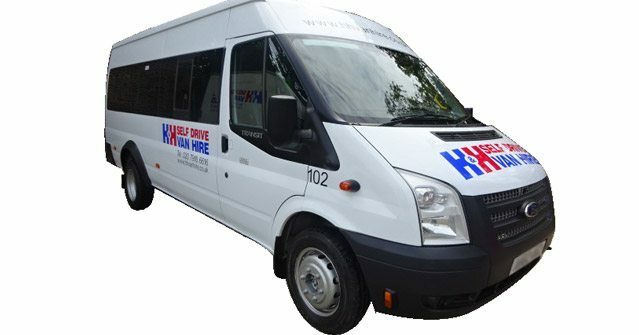 If you’re planning a group trip to Windsor to celebrate the royal wedding, why not hire a minibus from H&H Van Hire? London minibus hire is a convenient means of travel that allows everyone to enjoy the experience together. Please contact us for details of our cost-effective travel solutions, including our modern 9, 14 and 17-seater minibuses.